This is the site of a substantial watermill, which probably dated to the 19th century, and which stood on the site of a medieval watermill. 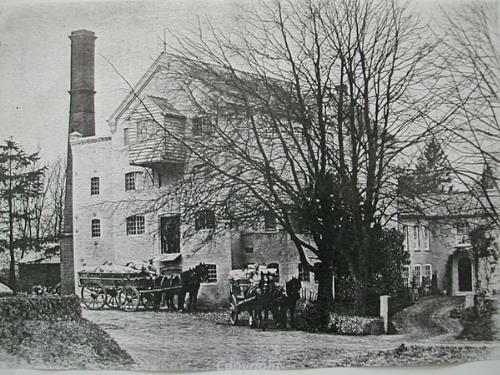 The mill burnt down in 1914 and was demolished. The miller's house has survived, and contains reused panelling. Various querns and millstones have been found in the garden. This is the site of a watermill which burnt down in 1914. Walls with doorways and iron framed windows remain as a walled garden. These apparently date to the 19th century. The river still rushes through a narrow race at this location. The Georgian miller's house survives, one room of which was a granary. Millstones have been used as garden ornaments as well as two objects which the owners call querns. One is a roughly circular stone ca. 0.5m wide which has been roughly hollowed out but now contains plants. The other is a lump with a square socket in the top. These could be the upper and lower stones of the quern, but perhaps only supports for posts. E. Rose (NAU), 26 October 1978. Photographs depict a large three-storey brick building with a chimney. Additional photographs show the remains of the building after the fire of 1914. A note with the photographs states that the top storey was added and a shinmey heightened after a Twine 3-sail roller mill was installed in 1894. There is or was a hydraulic ram in the loop of the river on the northwest side of the mill. A painting in the Rural Life Museum created in 1810 depicts a small thatched mill. The Georgian style building must have been constructed after this date. Information from index card, photocopies of photographs (S1) in file. H. Hamilton (NLA), 21 December 2007. A sunken area in the house garden may mark the location of the wheel pit. The panelling in the front room of the miller's house was originally from a house in Lincolnshire. The finds in the garden noted in 1978 consist of two puddingstone upper quernstones, one lower ditto, one millstone grit upper stone of beehive type, and a piece of the same size and shape as the latter but unlikely to be a quern due to the square hole. These stones will likely be moved to a new house to be built by the present owner. See notes and photographs in file. A. Gregory (NAU), 24 July 1985. The previous medieval mill on the site, known as Chapel Mill, is discussed within documentary research on the medieval chapel of St. Nicholas at Rougholm (NHER 2822). Information from (S2), filed under NHER 2822. <(S2)> Unpublished document: Davison, A.. The Medieval Chapel of St Nicholas at Rougholm and Union Farm, Gressenhall.